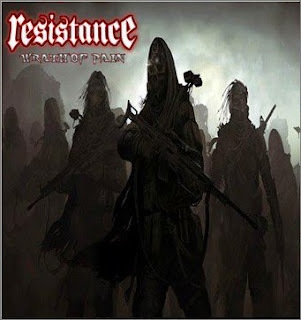 RANDOM: RESISTANCE "Wrath Of Pain"
With an adequate playing-time, "Wrath Of Pain" is yet another pleasant surprise for me. RESISTANCE from the fertile Sabah scene delivers in this release a 6 tracker of pretty convincing melodic death thrash that you'll mostly likened to the Scandinavian geographic than anything else. They wasted no time in lauching their scathing melodic attack from the first song 'Fallen Of The Flesh' until the very last second of 'Wrath Of Pain'. To get the point across, it is something like the Gothenburg melodeath brethrens take on thrashing out things. Things like the present ARCH ENEMY, or bands like THE DEFACED, or countless other Swedish melodic thrash Metal acts churning out these days. You can even assimilate some of what the last AT THE GATES offered in "Wrath Of Pain". These are the paths that RESISTANCE carefully thread on. These guys breathe the Gothenburg air for a living. I can guise it as another release from that exact location in Sweden and you will blindly believe it. And it is to my believe that if you're into these kind of Metal you'll appreciate "Wrath Of Pain"; lots. Nothing much is left to be improved here apart from a little more tightening here and there and perhaps slightly more powerful vocals deliverance. I applaud "Wrath Of Pain", I applaud the diversity and quality of most Sabah releases these days, and I applaud Earblast Records for this release.